The extraoral presence of taste signal transduction proteins has recently been reported in rodents and humans. Here, we report the presence of these signal transduction proteins in the cecum of a non-human primate, the common marmoset. 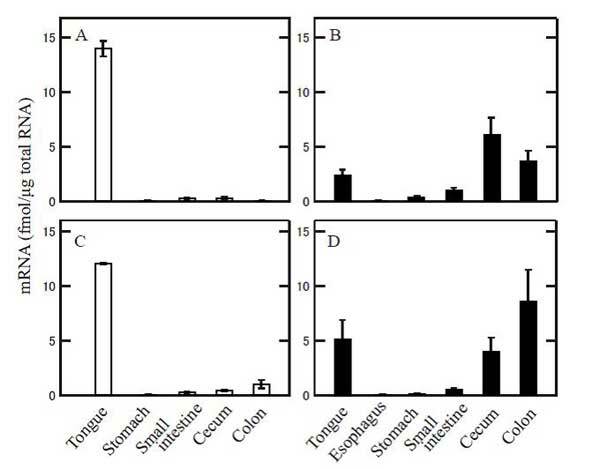 Quantitative RT-PCR data on the gene expression of taste signal transduction molecules (gustducin and TRPM5) in common marmosets suggested high expression in the cecum, which was not observed in other non-human primates. Immunohistochemical analysis confirmed the specific presence of gustducin and taste receptors in marmoset cecal cells. These results may relate to the specific feeding behavior of marmosets, which consume plant exudates, primarily gums. Quantitative RT-PCR analysis of gustducin in the gastrointestinal tract of non-human primates. Plots show the expression level of gustducin mRNA in newborn (A, n=2) and adult (C, n=2) Japanese macaques and in newborn (B, n=4) and adult (D, n=3) common marmosets. Error bars indicate standard errors calculated from three independent experiments on each individual.